The easy-to-install, easy-to-use 4.3″ echoMAP CHIRP 45cv is compatible with optional transducers for high wide CHIRP sonar and Garmin CHIRP DownVü. 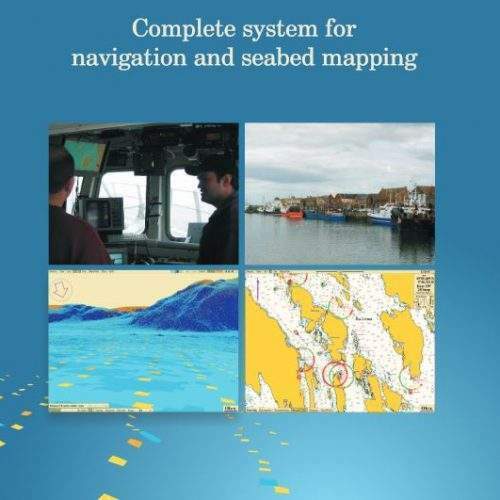 Includes Quickdraw Contours software to instantly create your very own HD maps with 30 centimetre contours. Internal 5 Hz GPS updates position and heading. Cables plug directly into the mount. Transom and trolling motor mounts included. The built-in sonar capabilities of echoMAP 45dv include CHIRP sonar, the most sophisticated sonar technology available for the fishing and boating public. CHIRP sonar provides amazingly clear target separation and definition because it puts even more energy onto the target than traditional sonar. 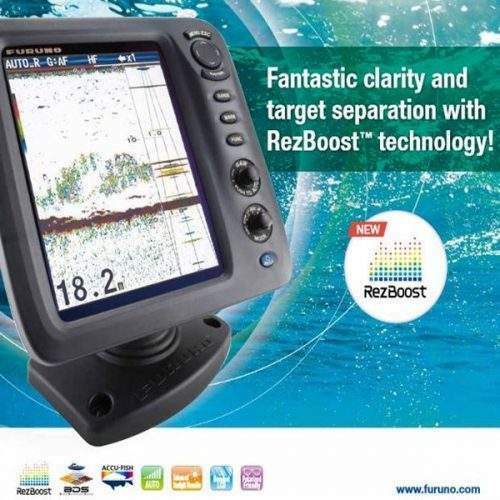 It also includes sonar-recording capability that coordinates the timing of the sonar return with your boat’s position and saves digital information for playback on a computer using HomePort™ planning software. Use the user data sharing cable to share waypoints and routes between multiple devices. 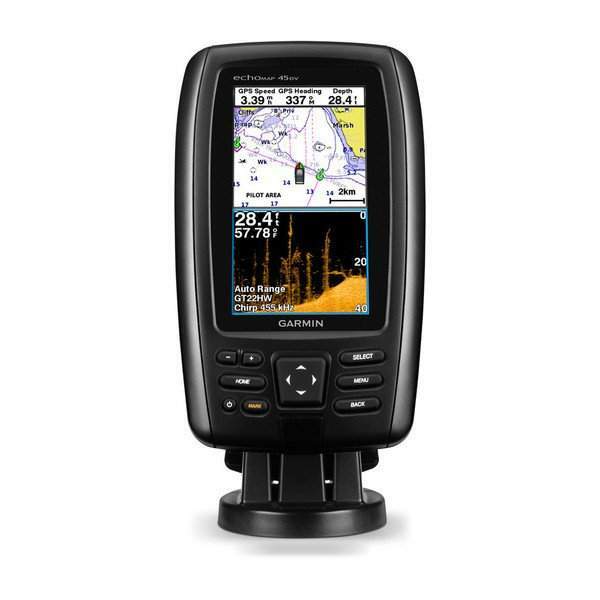 Garmin DownVü scanning sonar give you a nearly photographic image down to 225 metres1 below your boat. You clearly see structure, submerged objects and fish. Traditional Garmin HD-ID™ sonar and DownVü scanning sonar are combined into 1 transducer. Also provides HD-ID support for Minn Kota® and MotorGuide® trolling motors with integrated transducers. Quickdraw Contours is a free, easy-to-use software feature already installed on your echoMAP CHIRP 45dv. 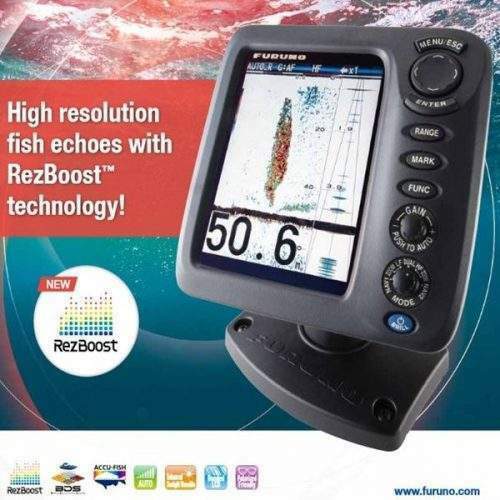 It instantly creates your own personalised HD fishing maps on screen with 30 centimetre contours. Tailor the maps as needed; you own them. Keep the data for yourself, or share it with Garmin or your friends. No special surveying expertise is required. You just fish while Quickdraw Contours creates maps. There’s no waiting around or sending your files away like other mapping software requires – your results appear instantly. Use with any Garmin Panoptix™ transducer, any HD-ID sonar, any CHIRP-enabled, Garmin DownVü transducer or NMEA 2000®-compatible depth transducer. Have more than 1 sonar device installed onboard? Quickdraw Contours automatically selects the most capable sonar device to provide the very best results for you. When you’re off the water, it’s easy to keep your echoMAP safe and secure. You don’t have to mess with plugging and unplugging wires from the unit because the cables plug directly into the mount. This allows you to quickly install and remove your echoMAP from power and the mount. A single microSD™ card slot provides expandable memory for accessory map purchases such as BlueChart® g2 or BlueChart® g2 Vision®. Based on your boat’s specifications, Auto Guidance instantly creates a visual path you can follow to avoid shallow water and other charted obstructions.